I've enjoyed Tucker Carlson's show and can't let it pass into history, as it did last night, without a mention here. MSNBC has said that Tucker will remain at the network as an at-large commentator, and I have a feeling that, liberated from show-host concerns, he might become even more uninhibited in the expression of his quirkily conservative/libertarian views. 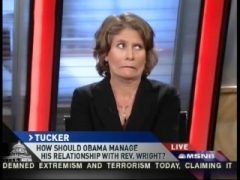 So let's usher Tucker out by focusing on one of our favorite nemeses, Rosa Brooks, the liberal LA Times columnist who appeared on the show's final episode. The unreconstructed Obama apologist offered the lamest excuse yet for his failure to have disassociated himself earlier from the ugly rhetoric of Rev. Jeremiah Wright: Barack simply wasn’t paying attention in the pews. TUCKER CARLSON: I like Obama, actually, and I like him because he seems the antithesis of Jeremiah Wright. I just have trouble believing that a guy who he himself, Obama, has described as that close, almost a member of the family, baptizer of his child, the man who married them, the person he's given a lot of money to, he had no idea that he had these views? That's hard to believe. ROSA BROOKS: You know, I think he saw him in the church context, he wasn't seeing him in his other manifestations. What? It was explicitly in his church context, right up there in the pulpit, that Wright spewed this stuff. But Brooks soldiered on, and a bit later came her clincher . . .
BROOKS: Probably sitting in church and not listening. I can tell you. I have heard of people who go to church and don't listen. As you'll see from the screencap, Brooks' defense didn't even meet her own straight-face test. But we'd certainly love to hear Obama try it: "it depends on what the definition of 'there' is." Or perhaps: "I smoked the sermons but didn't inhale." In any case, thanks for some good memories, Tucker, and see you down the road on MSNBC. I have bought into the fact Barack Obama is one really smart dude. And it's very hard for me to believe that he didn't know this about him in all the times he attended church, and spent time with this man, possibly prayed with the man, this man baptized their daughters and married them, and he gave him a leadership position or a title in his campaign that he didn't know Jeremiah Wright has said things, several repeatedly, that are anti-Israel, anti-white and anti-American. He's kind of run the table.